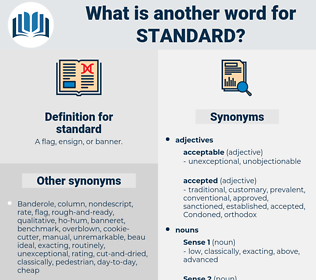 What is another word for standard? A flag, ensign, or banner. standardized, industry-standard, standards-setting, non-standard, high-standard. traditional, customary, stereotypical, standards-related, stereotyped, Superseded, normal, prevalent, lump-sum, record-breaking, recordable. trends, factors, RSS, limits, documents, lists, parameters, sections, Municipalities, clauses, groups, items, Activities, Histories, colleges, communes, normal. regulates, Comes, Does, limits, specifications. standards-based, normalised, standardised, substandard, habitual, harmonised, flat-rate, norms, uniform, one-size-fits-all, normalized. standardization, standardisation, norms, uniform, uniforms, specification, specifications, normas, switchboard, normalized. yardstick, standardization, standardisation, uniform, specification, specifications, switchboard. uncommon, different, irregular, abnormal, atypical. outre, novel, unknown, outrageous, nonrepresentative, nonconformist, unparalleled, freak, unexpected, unique, extraordinary, unexampled, idiosyncratic, striking, recherche, prominent, especial, salient, singular, unpopular, distinctive, phenomenal, oddball, outstanding, special, kooky, freakish, signal, unpredictable, unfamiliar, unorthodox, unwonted, scarce, exceptional, fantastic, conspicuous, unconventional, unusual, uncustomary, rare, infrequent, unprecedented, way out. There is no standard for truth. And I'm not going to have Mother twist and turn as she has twisted and turned for the last fifteen years in order to get me educated up to the family standard. sodium nitrite, sodium hydride, sodium nitrate. capacity unit, cubic measure, cubature unit, cubic content unit, displacement unit, volume unit, capacity measure, cubage unit.